It is an indisputable fact that I am deeply, irreversibly, head-over-heels in love with pie. Apple. Pumpkin. Blueberry. Banana Cream. You name it, I’ll eat it. As Thanksgiving approaches, I find myself longing for a slice of warm apple pie with a big scoop of vanilla ice cream. I also find myself contemplating the scientific majesty that is an apple pie. What majesty, you say? Well, friend, allow me to take you on a journey — from orchard to oven, from farm to table. Prepare yourself. Cozy up. Grab your snuggie. A tall glass of hot chocolate wouldn’t hurt either. Of course you’ll need some marshmallows. Got the marshmallows? Good! Let’s begin. There are few evolutionary success stories as impressive as the apple’s. Think about it. This fruit was able to evolve a trait so desirable (its deliciousness) that we humans have taken it from its ancestral home in the mountains of Kazakhstan to every populated continent on Earth. We have immortalized the apple in art; we have juiced them, fermented them, sliced them, bobbed for them, dipped them in caramel, engineered machines for the sole purpose of coring them and, yes, made them into delicious pies. You might think with all its uses that the apple must be a simple, easy fruit to grow. Humans are lazy, right? Surely we wouldn’t grow a fruit like the apple so much if it weren’t an easy thing to do. Wrong. False. Incorrect. Lies! Apples are incredibly complex. Apples are extreme heterozygotes, meaning that the genes they inherit from their parents can be radically different between one apple and another apple on the same tree. If you were to grow a tree from a seed taken from a Granny Smith apple, you would most certainly, not obtain a tree filled with Granny Smith apples. Your apple tree would likely produce “spitters” — nasty, sour apples meant only to be spit out. Every so often a sweet apple would be grown by chance, but not with consistency. So how do we manage consistency today? How do we grow a Granny Smith apple tree? Well, in order to produce a Granny Smith apple tree, you would need to graft one. Grafting is a horticultural surgical procedure whereby the tissues from one plant are transplanted into another, allowing for asexual reproduction of the primary tissue. As a result of this process, the tissues from the donor plant fuse with the tissues of the host plant and the resulting fruits are born from the genes of the donor tissue. Without this process, apples would never have been domesticated; planting an apple tree would be like opening a box of chocolates — you’d just never know what you’d get. It would be an adventure, yes, but 99 times out of 100, it’d be an unhappy one. Through grafting we have become slaves to the apple, spending billions of dollars per year on pesticides aimed at keeping the sweet apples we love away from the dark precipice of extinction. And for what? For pies. And to be perfectly honest, that’s all the reason we need. The next thing you’ll need for your pie is a crust. There are many recipes that one can use to make a pie crust. But so far as it is an indisputable fact that I am deeply, irreversibly head-over-heels in love with pie, it is also a fact that the best pie crust recipe is indisputably my great-grandmother’s recipe. But I will not be supplying you with this recipe. This is not a “how-to” guide. Get over it. I will however, confide in you, my dear reader, the identity of one crucial ingredient. It’s flour. I know. Revolutionary! But don’t tell anyone. It’s a secret. Now that you know this deep, dark secret, you probably have some burning questions. If you’re like me, the first question you are probably asking yourself is “What are the explosive properties of flour?” Lucky for you, I have the answer! As it turns out, flour is, indeed, an explosive substance. Flour is composed primarily of starch, which is, in turn, composed primarily of glucose. Glucose is highly combustible — it reacts with oxygen to produce carbon dioxide and water. When ignited by a flame, the sugars explode! Boom! Normally, this process is highly controlled — cells convert glucose into pyruvate through glycolysis and that pyruvate is then converted to carbon dioxide and water through the citric acid cycle and oxidative phosphorylation. Through these processes animal cells produce the energy needed for carrying on with their day-to-day metabolic processes and that’s all good and well, but it’s probably not the type of combustion you were thinking of. Where are the explosions? Where’s the excitement? Well … this is the excitement. Your cells have the ability to carry out explosive reactions in a manner so intricate and organized that they cause no harm to you whatsoever — in fact, they help you. On a second-to-second basis, your body is “exploding” sugars and harnessing their energy. So put that energy to good use. 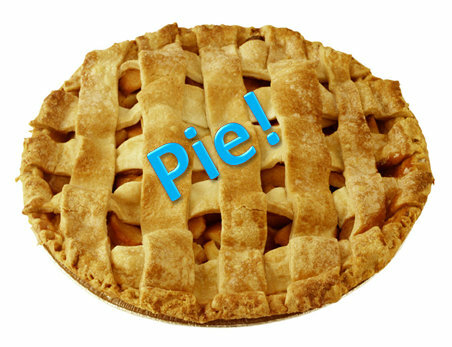 Invest it in digesting more pie. Of course there are many other ingredients that go into making the perfect apple pie (cinnamon, nutmeg, sugar, butter), but we will not address those here. We will, instead, end our journey with a discussion on ice cream — apple pie’s obligatory sidekick. Ice cream is a dairy product, meaning it is derived from mammalian milk. Humans have been consuming milk since the Neolithic revolution, but it wasn’t until Louis Pasteur invented pasteurization that dairy products such as ice cream could be made and stored for extended periods of time. Pasteurization is the process by which milk is heated and cooled in order to reduce the amount of pathogenic microorganisms in the product. Once pasteurized the milk is free to be used as an ingredient for whatever ice cream your heart desires! But as for me and my heart, we will desire vanilla. If you’ve stuck with me this far, congratulations, your dedication is about to pay off! How, you ask?! Why with a discussion on the colligative properties of rock salt, of course! If you wanted to make your own ice cream, you could do it by filling a bag with milk (1/2 cup), sugar (1 Tbs), and vanilla (1/2 tsp), sealing that bag, and placing it in a larger bag filled with ice (4 cups) and rock salt (4 Tbs). Gently massage your bag for 5 minutes, or so, and voila, you’ve made yourself ice cream! Witchcraft! You exclaim. No, silly! It wasn’t witchcraft. It was science. You see, salt has the ability to lower the freezing point of water (meaning that it enables water to remain liquid beneath its freezing point). For your ice cream, this means your ice/salt mixture will keep your milk/sugar mixture sufficiently cool for it to freeze into ice cream despite the fact that it’s sitting in your warm, cozy hands in your warm, cozy room. It also means you have a quick, easy way to make yourself a side dish for your apple pie! By now you’ve probably finished your tall glass of hot chocolate and are wondering what to do next. This article is almost over; you’ll soon be left on your own. What will you do? Well, if I may make a suggestion; go make an apple pie and some vanilla ice cream. Bake it. Eat it. Respect it. Admire it. After all, it came a long way to get where it is today. Also, pie is yummy and delicious. Andrew graduated with his BS in Biology from Georgia Tech in 2013. Since then he has been teaching high school as part of Teach For America in South Carolina. He enjoys reading, spending time with family, and cooking. He is also a black belt, a classically trained pianist, and an occasional gardener. When at home, Andrew is rarely found outside the comforting arms of his Snuggie.